The week itself has been very enjoyable, have revisited a few ‘old friends’, made a few new ones, and was sorry to see a few landmarks from past visits are no more, closed down I assume by the economic crisis, but dont quote me on that. No, the picture background is a digitised add on, but that is really me. You get your photo taken as you start the visit, and then there’s a place to see it on the observation desk, and select your preferred background. Most amazingly, to get the picture by email, is free! Thats right, I couldnt believe it either, especially over here! Then a first, at the science museum, I got to see a film in 3D, so weird! Not the film, it was about the Arctic, but the effect. They did this thing with the titles, so they turned to ice, broke up, and seemed to fly towards you. And yes, at one point, I moved out the way, lol. Well, I am blonde… Other than that, I’ve been to a lot better science museums in all honesty. The Aquarium the next day was quite good though, as was the harbour cruise, all 4 of those things done on the City Pass, good value at $69 considering. Much of the rest of the next 2 days was spent walking around, shopping, drinking coffee, but a lot of it just walking, seeing sights, old and new. Was sorry to see the Online Coffee House gone, but I guess progress has overtaken places like that in the last 9 years, PC’s are no longer the only way to get on the net of course. But the place where my back was introduced to the pleasure of a massage 9 years ago is still there, though I’m not sure if its the same lady, my memory isnt that good. Today I went to Tacoma, definitely the poor relation of the 2 linked in name by the airport I shall fly out of tomorrow at least. Tomorrow, I shall combine the 2, and go to SeaTac Airport, and fly home, well presumably I will, looks nervously at American Airlines for all this! I trust someone will check the flight before leaving home to collect me, lol! I wouldnt say the weather has been perfect over here, but it hasnt been too bad. Seemingly a lot, lot better than at home, thats for sure! Sorry, no video. Nothing personal and all that, but all the same… Primarily, I have internet here, and its a decent enough feed for most things. But trying to watch music videos on You Tube…you get my drift? 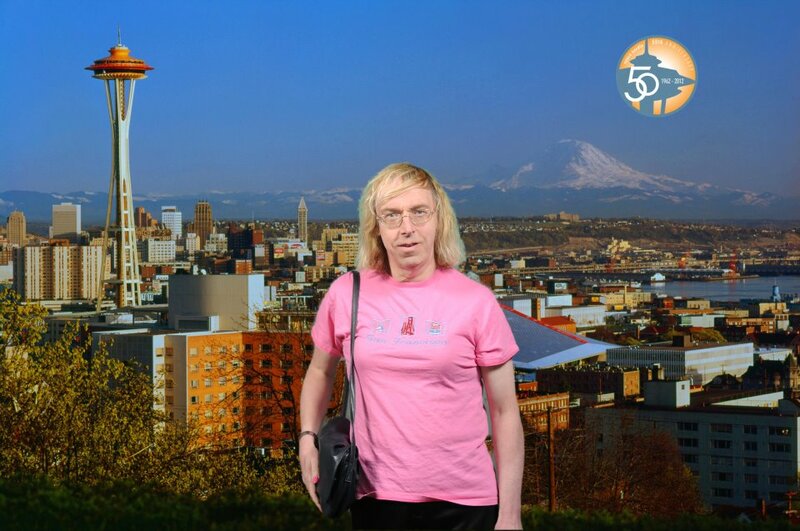 So, this is Stevie Lou, closing for now from Seattle, saying I’ll see you again back in England…God willing! Friday will be about getting the body in shape, especially the back, which is proving problematical yet again at present. Oh, and getting the nails done of course. It will be good going back to Seattle again, or will be when I get there at least! The actual flights to and fro, no, I’m not looking forward to those, the main reason this will be the last West Coast trip for the foreseeable future, the body is just getting too worn out for journeys like that. Oh, and for those who read the last post, none of my horses came anywhere in the National yesterday. No surprise there, lol! I need this holiday in more senses than one, mainly the one about getting totally away from work for a while, even if its only for a long week. I could make a joking comment about recharging batteries, but not really fitted out for that lol! The song, well I remember when there was an airflight travel guide called the ABC Guide, and having mentioned one, two and three…Wasnt a favourite, but did seem apt. Is there a big race this week? Yes, I am being cynical here, I know, and I suspect many others do as well, that this Saturday, the Grand National will be ran at Aintree, as (with the exception of war years) it has been for over 150 years. The most famous historical thing, the name of the first winner was called Lottery, rather apt for said race. One thing that many may not yet know, is that in this country at least, it will be the last time its covered by the BBC for at least the foreseeable future. No, I’m not going to go into the politics of BBC sports coverage in the last decade, but suffice to say, they have cut back rather dramatically lol! The first Grand National I still remember is 1967, probably because of events then, more about which shortly. I must have seen them before then, just dont remember them at all. Since then, working in the industry, I’ve seen a few things concerning this race. The void race fiasco, the bomb scare that delayed the race until Monday, and of course, Red Rum and his 3 wins. No, I’m not going to hand out tips, I dont really follow racing enough for that nowadays to be honest. Probably wont stop me throwing a few pounds at the bookies though lol! Besides which, as mentioned, its all a bit of a lottery anyway, though less so nowadays, with some of the fences tamed somewhat. The film, no music, just film (in colour!) of that first National I still remember. What can I say, just proves you should never say a horse is out of a race until it actually is! Yes, you can tell the domestic cricket season is about to start again, they are forecasting snow in April, lol! Is it just me, or does the season seem to start earlier each year? No, I’m not going to bore people with a long discussion of the merits of each county team, and who will win the various titles etc, as I’m sure those who care will have their own opinions on these matters anyway. Lets just leave it at saying there are a good number of irish cricketers playing for counties, a matter that can only mean good things for the national side. Who, by the way, have recently qualified for the 20 over World Cup in September, in Sri Lanka. Lets look at a fun issue, which county should I support? The first county I really remember following would be Kent, not because they were my first county, but it was where I was living when I first took interest in the sport. Those were very different days though back then, no great media hype, and getting players to sign autographs for you was roughly akin to asking to meet the Queen. An attitude I’m pleased to say has changed dramatically, and so much for the better. Then I moved to Somerset, and started following them at the perfect time to do so, with names like Botham, Richards and Garner in the team. Yes, in those days international cricket wasnt such a behemoth that players actually had time to play for their counties as well. Taunton was (probably still is) a lovely ground, and I still sort of follow Somerset even now, aided by one George Dockrell now being in their squad of course. Despite 2 years in London, I never really got involved with any of the teams there to be honest. I have been to Headingley for a county game since I moved back up here, but dont really feel any great affection for the team, though perhaps I should? In all honesty, I’m more likely to follow the details for the counties with Irish players in their teams lol! The last couple of years, I’ve managed to see Ireland play, internationals against Bangladesh, and then last year against Namibia. Thats become more important to me than county cricket in all honesty. Sadly, its unlikely to happen this year, as the games planned so far clash with Euro 2012, and that means a very busy time at work. And no, I definitely wont be going to Sri Lanka in September either! I will watch it on TV, assuming it doesnt clash with a US trip that I dont yet know the dates for, stll waiting for the NFL to release the schedule for that, hopefully soon! So yes, we might be having a drought in areas of this country at present, but I’m sure the start of the cricket season will change all that! Oh, and probably snow somewhere too lol! Still, 3 weeks from now, I will be in the land of Baseball, really looking forward to that.